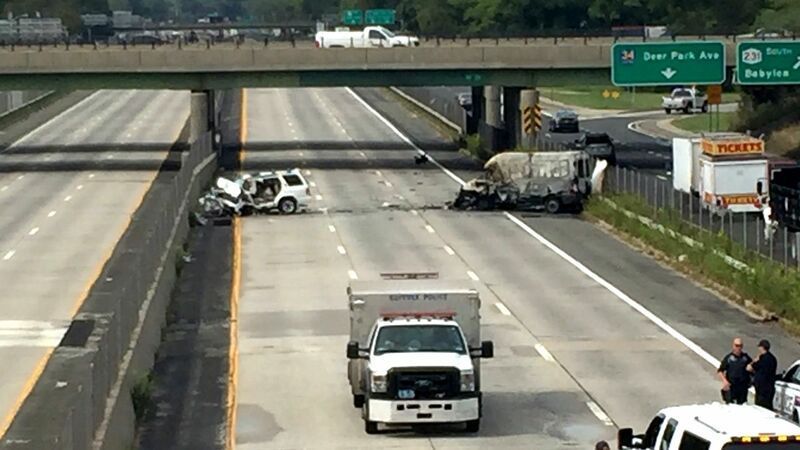 WEST ISLIP, Long Island (WABC) -- A Suffolk County police officer who was allegedly drunk when he was involved in a deadly wrong-way crash on Sunrise Highway pleaded not guilty Wednesday. Robert Scheuerer, 24, is charged in an eight-count indictment with aggravated vehicular homicide, reckless endangerment, aggravated driving while intoxicated and other charges. Prosecutors have said Scheuerer had a blood-alcohol level of 0.17 - more than twice the legal threshold - when he crashed his 2000 Nissan Pathfinder into a 2016 Ford van on September 27. He was off duty at the time. The van caught fire, killing 37-year-old Brian Fusaro, of Bay Shore. Scheuerer faces a maximum of 9 and 1/3 years to 26 years in prison if convicted of all charges. Scheuerer is out of the hospital but is said to still be recovering "from very serious injuries."